Since 1850, Emile Henry has produced in France a large range of high quality ceramic cooking utensils. With a 10 year guarantee, our products are made from natural materials and have been designed and manufactured in France, in Southern Burgundy. Controlled production, without waste, is part of our daily commitment: the CO2 expelled from our workshops is particularly low thanks to our modern firing techniques that require less energy. The waste in general is recycled and the water used in production is filtered and used again in the production process.Our dishes have always been produced in France, in Marcigny in the south of Burgundy: it is a tradition and savoir-faire which has been handed down from generation to generation. Each worker prepares his moulds, produces his dishes and signs each one with his initials. We are proud of this responsibility entrusted to each of our workers, which is a pledge of quality for all our production.The result of 2 years of research, our Bread Cloche will quickly become your best friend ! 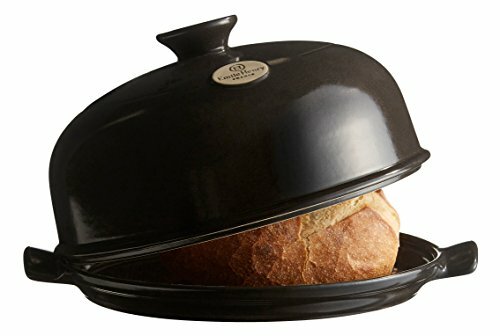 The rounded shape of the cloche is identical to a traditional domed bread oven, to ensure that your bread has the required level of humidity during the cooking process. Our innovative refractory ceramic will enable you to get a nice, thick crust with a firm, light inside. Rediscover the pleasures of making home-baked bread, with original and simple recipes. The included recipe book gives you advice and tips for making your own bread like you've never done before ! All Emile Henry products are made in France and offer a ten years guarantee. CONTROLED TEMPERATURE. The lid traps steam from the baking bread to create an environment similar to a steam-injected oven. The steam gives the bread a crunchy, chewy crust. The Emile Henry Bread Cloche is sized for a round loaf made with 3-cups of flour. Recipe and Instruction booklet included.